How good is your imagination? 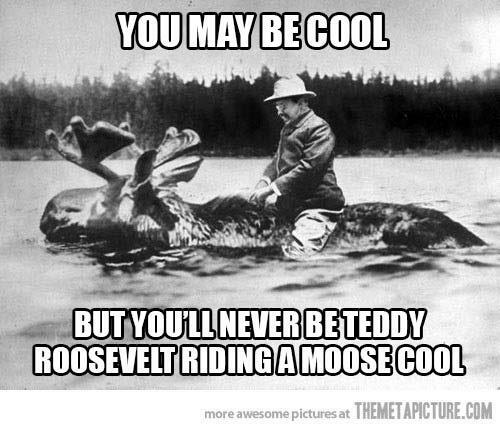 Did you ever imagine riding a moose in a river or lake? Why not? I mean, come on, Teddy Roosevelt actually did it (not photoshopped according to History.com and Life Magazine) and you didn’t imagine it? Me neither! But then, I would have gone to the hospital if someone shot me. Not Teddy. Campaigning for a third term, he was shot and delivered his campaign speech, bleeding from the undressed bullet hole in his chest. Yeah, officially the most badass President ever. What about your imagination? What are you doing to nurture and encourage it? It’s a skill, like any other. Visualize, read and analyze fiction (ahem, Annotation Nation anyone? ), read things you would never read, do things outside of your comfort zone, take a dare, play with a kaleidoscope, ask questions of strangers outside your usual social circle. Write a story in another genre. Try role playing. Take an acting class. Read Diane Ackerman’s A Natural History of the Senses. Go outside, lay on the grass or the beach and watch clouds. Play games that involve recognizing patterns. If you train yourself to see patterns, then you can combine things in new ways. Have fun! And if you have suggestions, please share them. Thanks! Yes! Years ago I became infatuated with some pix of the Keukenhof Gardens outside Amsterdam, and within six months I was assigned to write a story on them. Whoosh! Imagination is powerful stuff. Most awesome thing I’ve ever seen online.